Darcy Menchin is in my opinion one of the top 3 lure makers in the Hunter Valley. A top bloke to boot. This is one of his styles called the "F`Nuck" named after the first knuckle of the index finger. 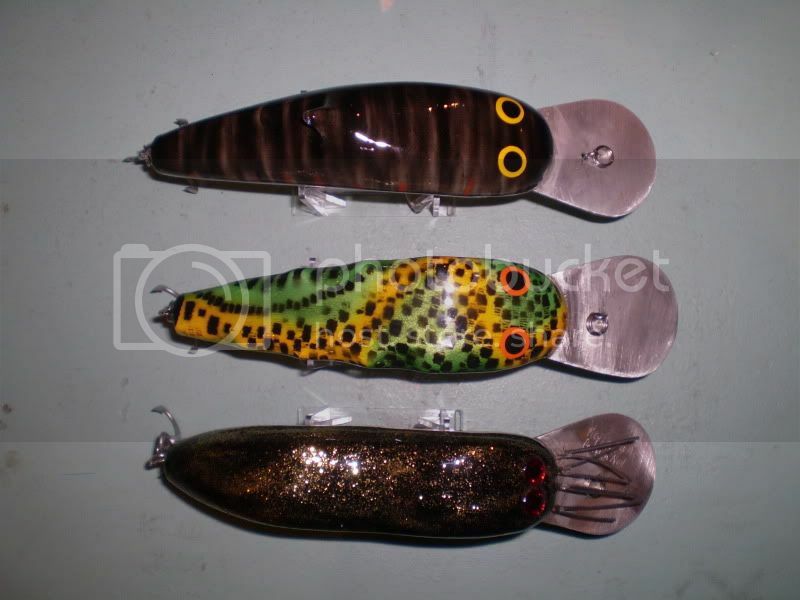 The sizes, the large one is around 120mm body. 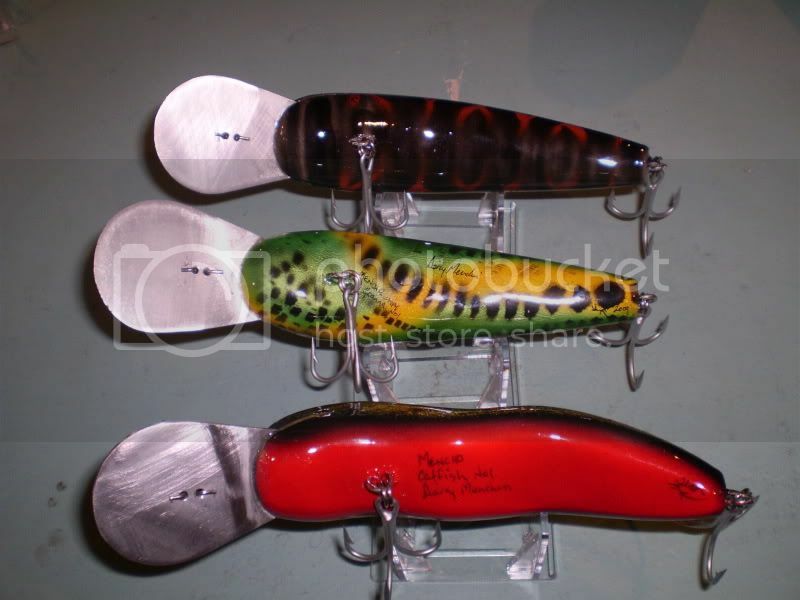 Two of the best paint jobs I think I`ve seen on lures.Works of art. Very nice Ziggy I think you should send them down so I can get a better look. Fang, i`d love to mate but there`s a rule about posting lizards.Aust Post,you know what they`re like. Adam,if you bring yours up, we`ll be able to throw them all in a bucket & go for it. The chief might put his in too,but you know how he can be. Adam, I`ve got to talk to Darcy about that Arachno, it`s a classic. This won`t be for a while due to my hopefully temporary ban on lure buying. As the Moderator I better ask what a Fnuck is before someone else asks me what it is. Tagged wrote: As the Moderator I better ask what a Fnuck is before someone else asks me what it is. Tagged,it's a lure.See above . Not good to hear you've been banned from lure buying Ziggy.My wife tryed it once, but it didn't last long. siegfried wrote: This is one of his styles called the "F`Nuck" named after the first knuckle of the index finger. Tagged, it does sound a little different but innocent enough. Just no sense of humour my wife. I can see it now, they must be all broken F Nuck's just like mine. Tagged, has that one come out of your collection,you`ve removed the trebles. Last edited by Goodoo on Wed Aug 19, 2009 12:10 pm, edited 1 time in total. siegfried wrote: Adam, I`ve got to talk to Darcy about that Arachno, it`s a classic. Some more of Mencho`s magic. That'll be a winner on the ant eating Bass at Glenbawn Ziggy.Jiggle,jiggle......SMASH, I can see it now. Amazing stuff guys, works of art. As someone thats tried to make a lure or two, without success. They make it look easy.